It winds me up somewhat, on occasions like National Poetry Day, or in public discussions about poetry among the mandarins of the cultural elite, that the richest, most diverse and thriving field of poetic endeavour is more or less completely ignored. The academy thinks it owns the word ‘music’, and qualifiers such as ‘popular’ or ‘folk’ are required to distinguish other practices from the self-evidently definitive Western art tradition, sometimes grudgingly tagged as ‘art’ music, which is a breathtaking arrogance, not to mention an insult to every artist working in another genre; similarly with poetry. I’m the first to argue for the specificity of forms, and to defend songs against the attempted critical manglings of those writers who’d like to locate the entirety of their meanings in the lyrics. Rap too is clearly a specific form in its own right, and demands to be approached on its own terms, but at the same time, there’s no remotely workable definition of poetry that doesn’t also describe rap. ‘Literary’ poetry, in its current form as a socio-cultural practice, embodies a range of aesthetic assumptions that exclude, or can’t even see, the fields of value in which rap stakes its claims. The fact that rap tends to embody the political, cultural and sexual values of young, working-class men is uncomfortable at best for the middle-class, middle-aged liberals who make up most of the audience for ‘literary’ poetry, but that doesn’t make it any less worthy of consideration as poetry, or any less deserving of valuation on appropriate terms, rather than by its degree of conformity to somebody else’s values. So why have I opened this review with a vitriolic rant that doesn’t even mention Melanin 9? Well, one of the adjectives I applied to rap above is ‘diverse’: some of it is comedy; some of it celebrates hedonism; some of it celebrates materialism, or machismo and violence; some of it is explicit political polemic; some of it grapples with subjectivities and personal relationships; some rap is concerned with its own formal potential, or with the aesthetics of language. Most of it does more than one of these things, and the best of it does many of them; Magna Carta can be quite clearly located on that continuum, as socially aware self-expression that is, above all, concerned with the substance of language, and the business of making things out of it. In other words, it’s the kind of rap that is closest to ‘literary’ poetry in its aims and methods. When I listen to Radio 4 and someone is talking about ‘the year’s best poetry’, or some such asinine formulation, there is not the remotest possibility that they will be mentioning anyone like Melanin 9, but these flows proceed with a combination of symmetrical regularity and emotional prosody that resembles literary verse more than it does much rap. On a piece like ‘Colour Blind’, lines and thoughts are dropped into space, a calm terminal rhyme scheme eliciting a contemplative response, the loose, conversational declamation seeming to offer dialogue rather than the clipped certainty of much hip-hop. Of course not every track is like that, but even at its funkiest, Melanin 9’s flow eschews the cross rhythmic stress and rhyme patterns, the sportive wordplay, that is so often (and justifiably) presented as an emblem of mad skillz; this MC seems to me to love language too much to risk trivialising his delivery with cheap tricks. There’s a sensual pleasure in the phonology of his vocabulary, a relish for the materiality of the words, that goes hand in hand with a semantic density, making no concessions to accessibility. These bars are not an exercise in aesthetic formalism, however: they present specific personal experiences, with a precise understanding of their socially constructed nature. There are no political prescriptions here, but there is a distinct sense of radicalism, an anti-authoritarian critique of the sort that arises naturally from free thinking in an un-free society. The music is illuminated by a dark fire of self-knowledge and resistance, manifest in the shadowy and doleful beats as much as in the lyrics. Even in the sexually celebratory ‘Love’s Stencil’ the feel resembles the righteous spiritual endurance of roots reggae more than it does the romance and eroticism of the love song. The degree of commitment and seriousness with which this album has been assembled is hard to miss. Guest emcees are few and far between, and although production duties are handled by a variety of contributors, the overall sense is very much one of a single voice and vision. I didn’t find my head nodding to this album, as it often does when I’m enjoying hip-hop; nor did I find a grin springing to my lips as it does when a rapper’s verbal ingenuity surprises me. That’s not the sort of record this is. It’s not a sugary treat, but a complex, bitter flavour, whose less appealing surface is a token of the many intertwined threads and layers of experience that will reveal themselves if it’s given time to dissolve on the tongue. I found myself listening ever more closely, concentrating in the same way that I do when I’m making music, trying to hear the big picture and every small detail at the same time, as though I was listening to jazz. This is not entertaining music, and to say it’s ‘moving’ or ‘thought provoking’ is a glib simplification, although it is certainly both of those things. 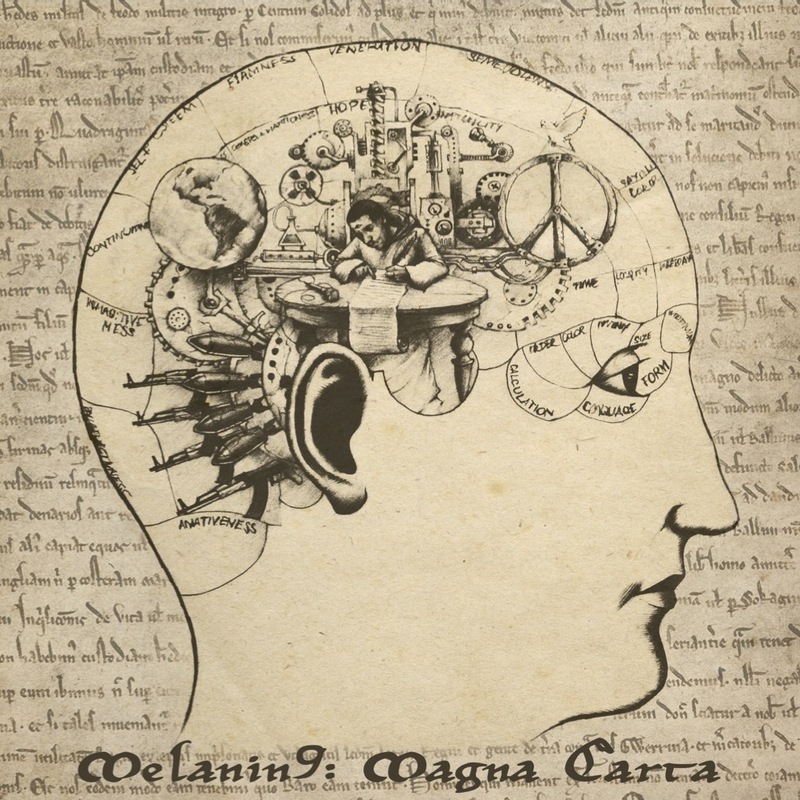 For the listener willing to attend to it with the same seriousness with which Melanin 9 applied himself to making it, Magna Carta is a world. Like one of Rothko’s Seagram Murals, it pulses with colour and intensity, and like the poem with which Neruda signalled his shift of focus from the aesthetic to the political, it ‘explains some things’. But it would be unfair to this record to view it as an exemplar of hip-hop’s value as an art form, and unfair to hip-hop to compare it to ‘great works’ in other forms; this is an artwork of great power, remarkable vision, and pinpoint accuracy.